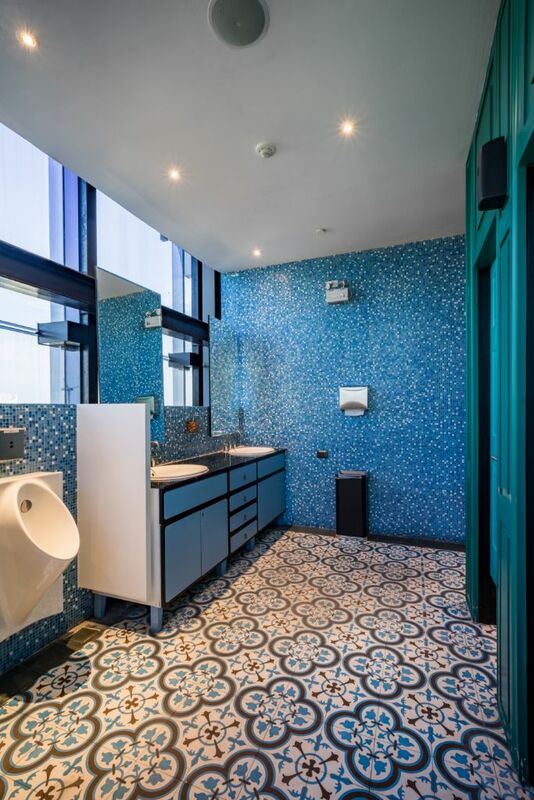 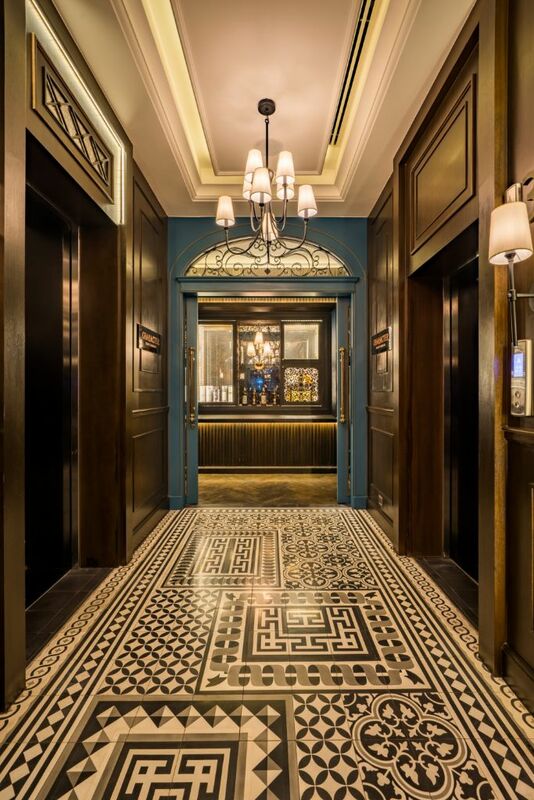 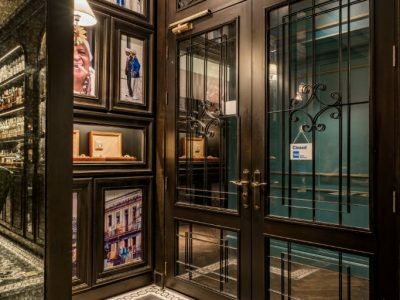 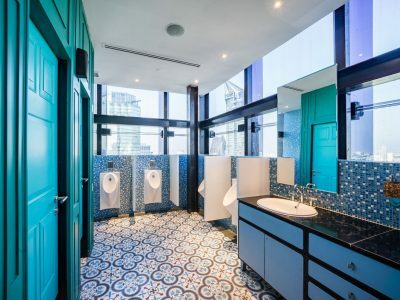 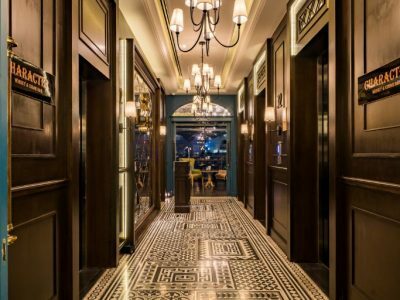 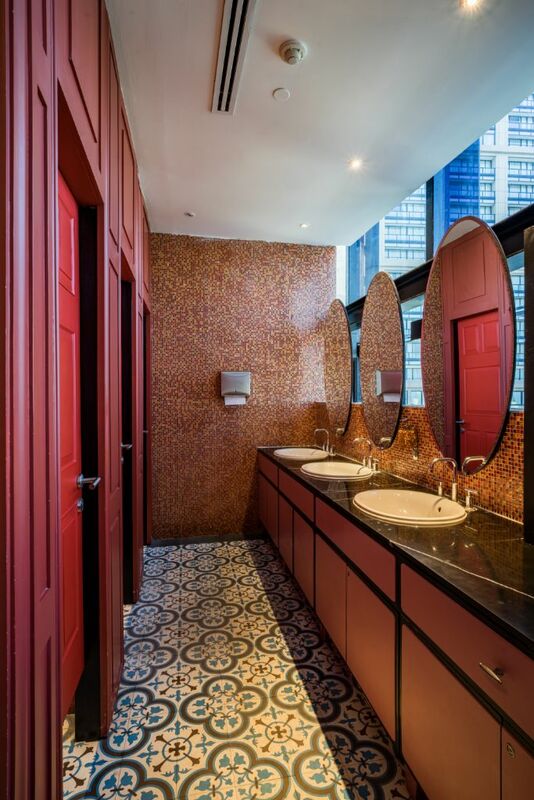 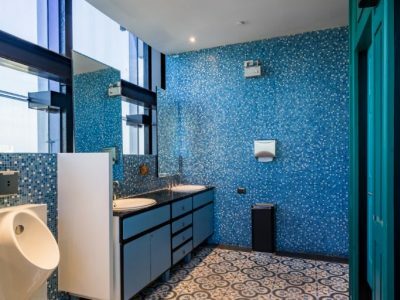 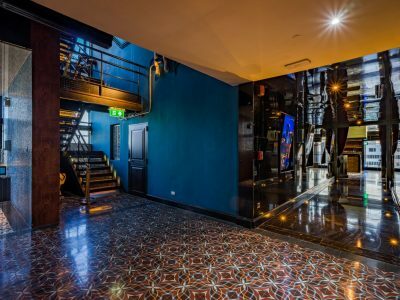 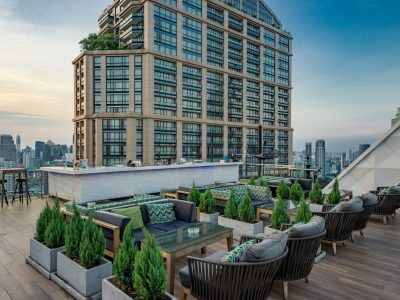 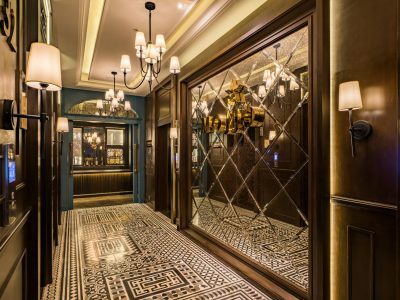 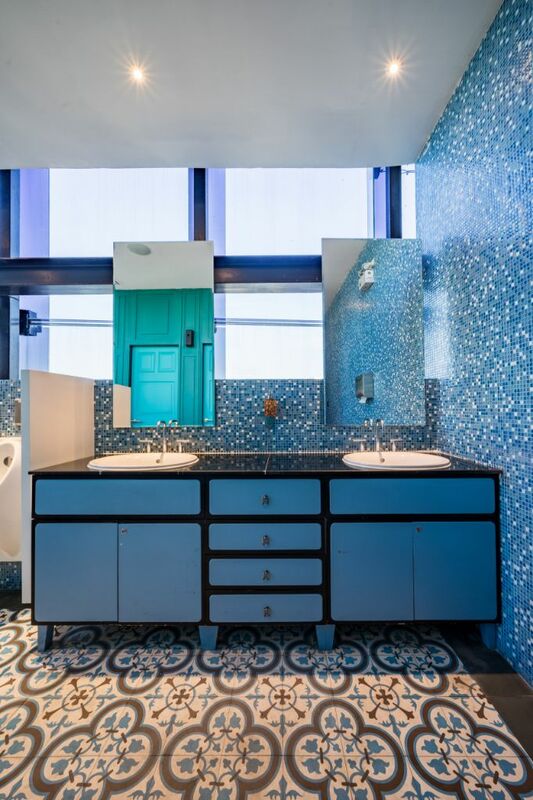 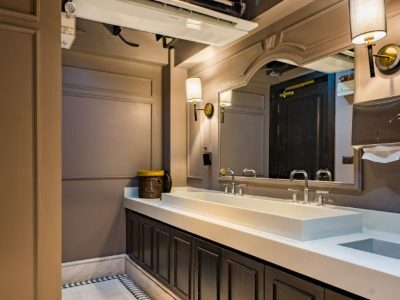 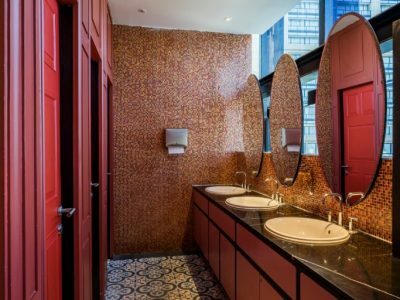 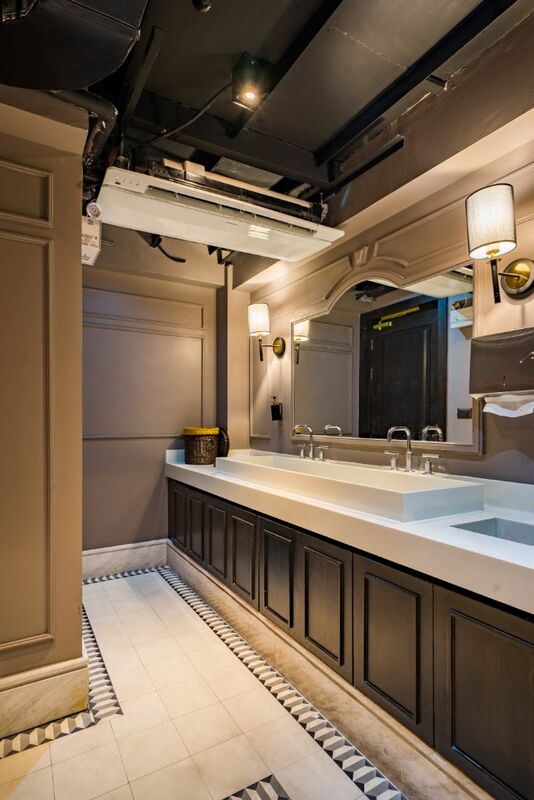 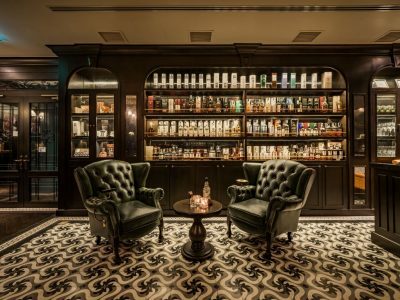 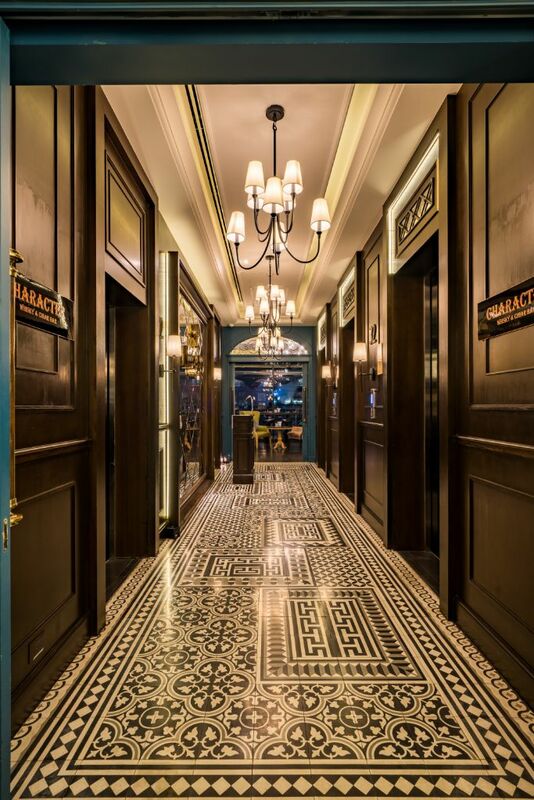 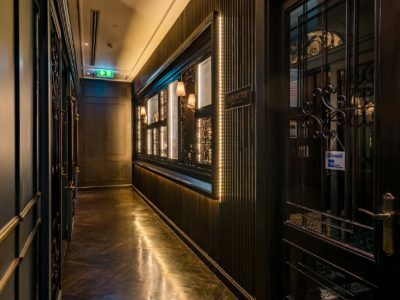 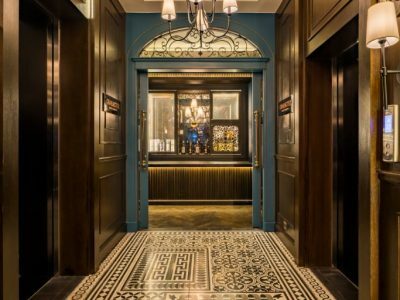 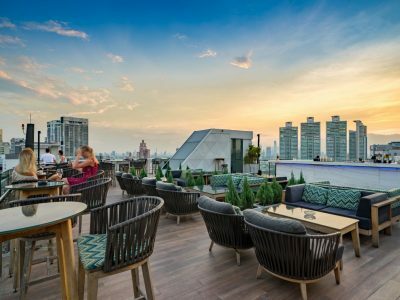 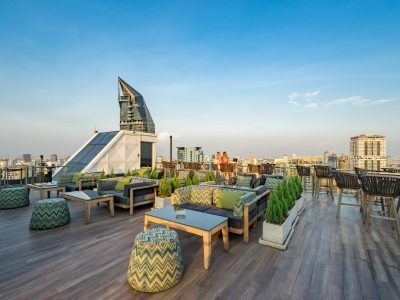 Located on Sukhumvit Road in the hearth of Bangkok, behind the Emporium Mall, the SkyView Hotel provided Gema a great opportunity to reveal its multidisciplinary talents in hotel design and interior design. 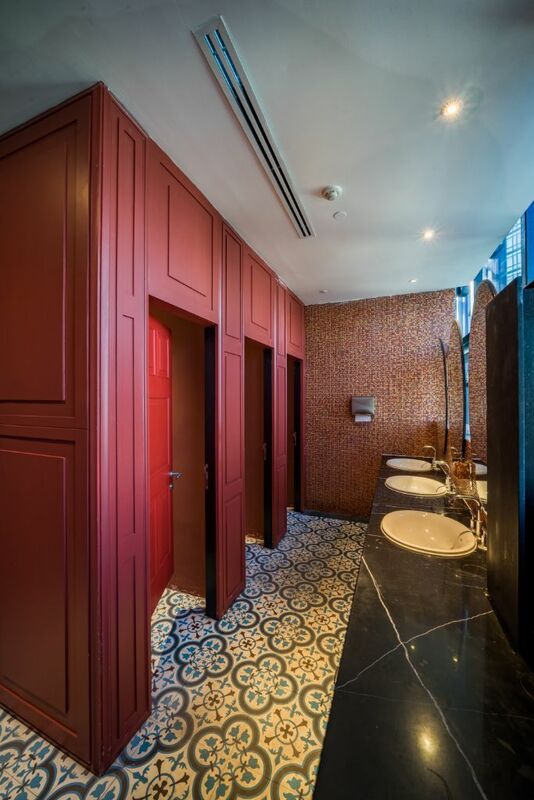 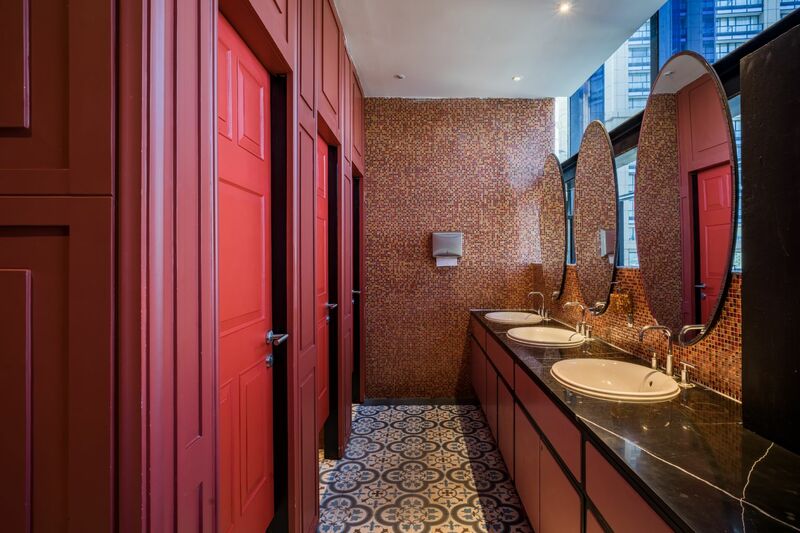 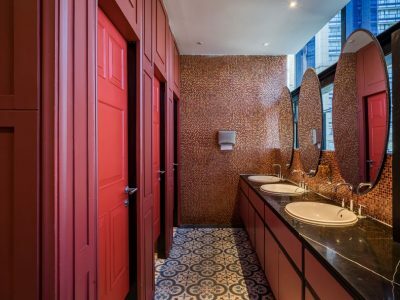 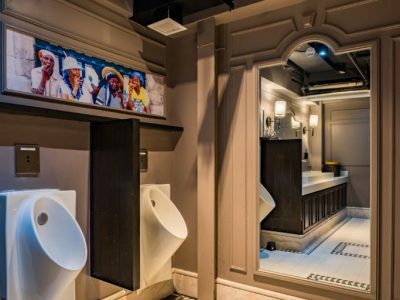 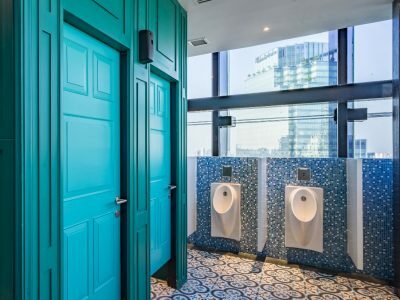 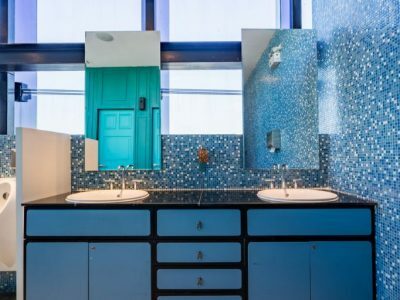 Gema, a reputed architecture and interior design firm based in Vietnam, was commissioned to create separate atmospheres for the different areas of the new boutique hotel. 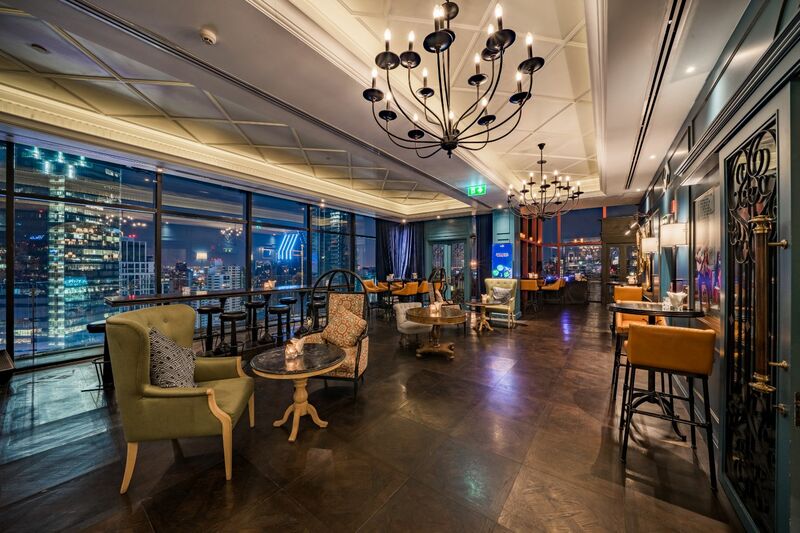 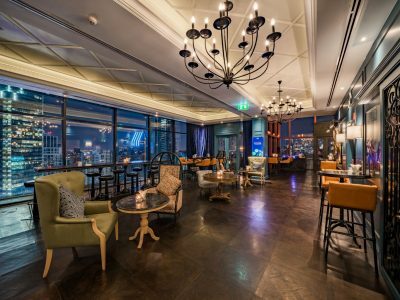 The first part of Gema’s collaboration in hotel design concerned the new Mojjo Lounge Bar, offering complete views of the city from the 32nd floor through vast windows. 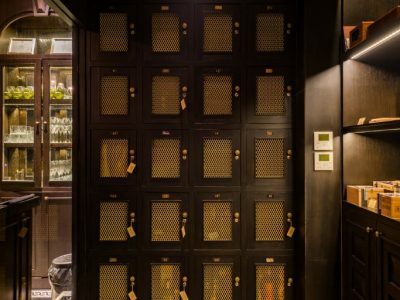 A long space framing a large collection of fine bottles with rich wooden panels, the Mojjo plays on its Cuban inspiration from mid- century Havana pastels by creating a sense of refinement and luxury, allowing Gema – Architecture and Interior Design to display its experience in bar design and F&B, mixing effortlessly modern and classical touches. 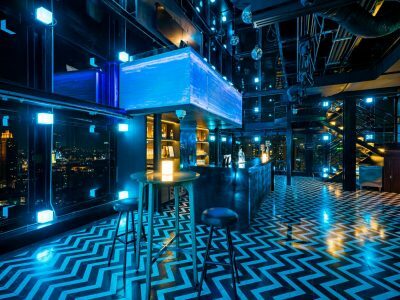 Dynamic patterns from the dark wooden floor energize the whole space, balanced by the regular sunken ceilings glowing softly. 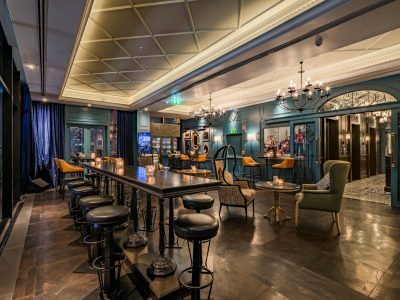 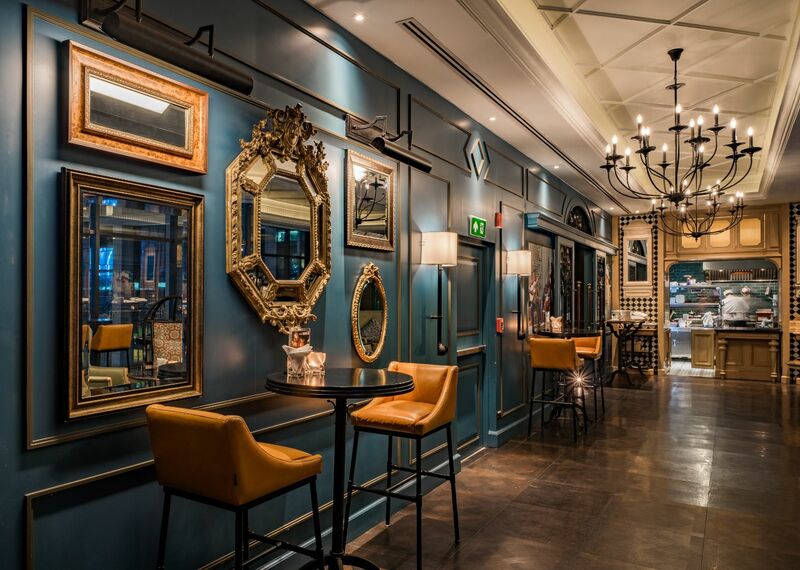 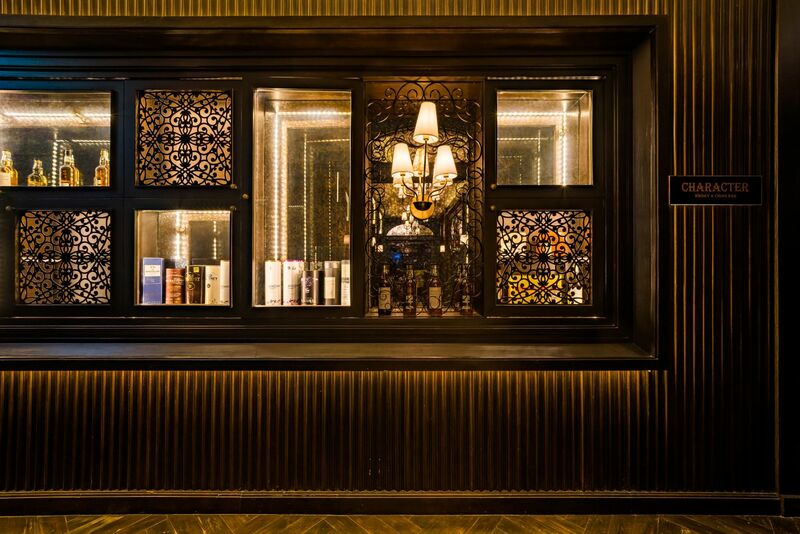 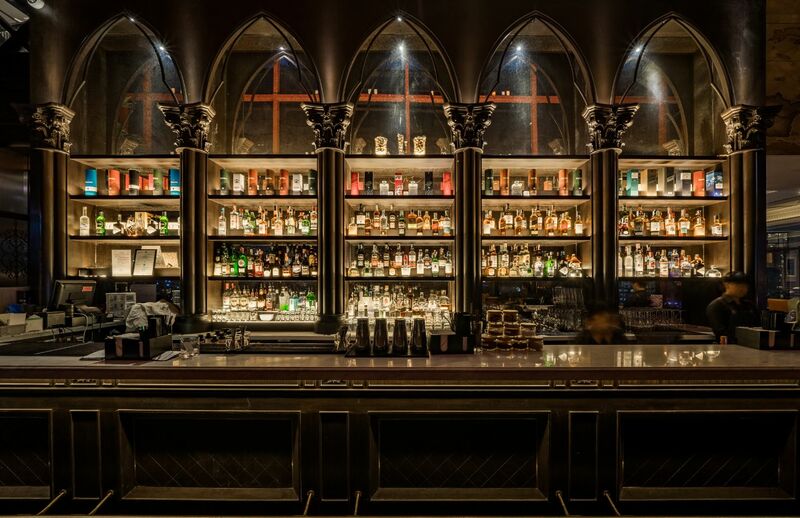 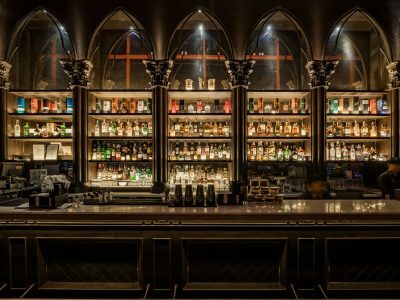 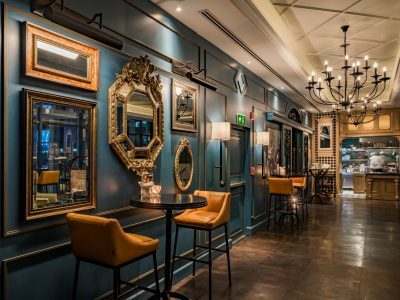 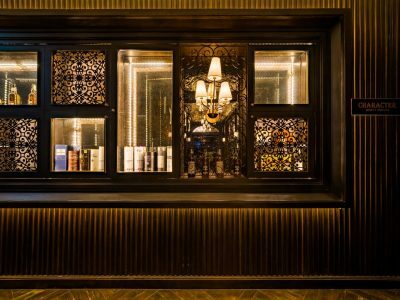 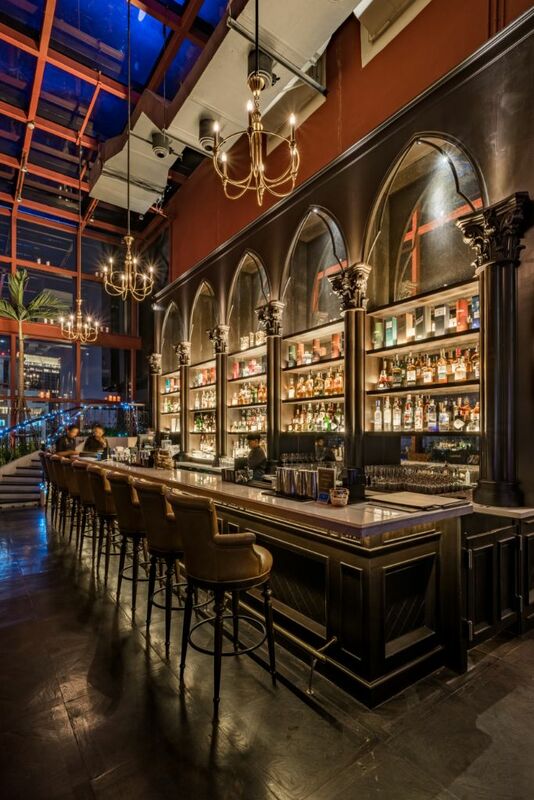 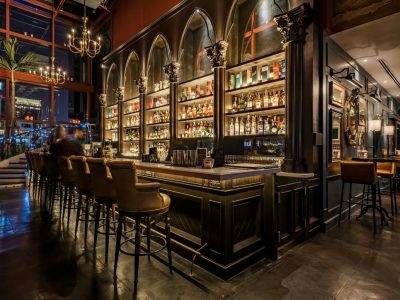 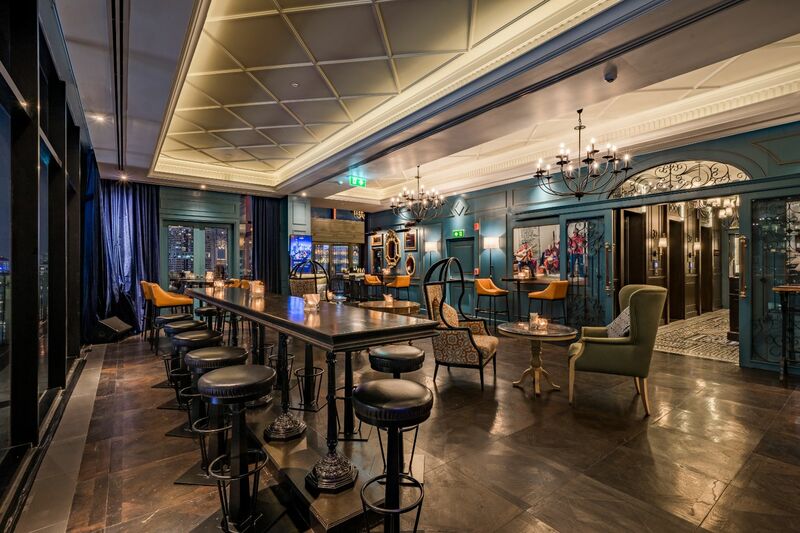 The opulent symmetry of the bar is enlightened by contemporary pieces selected by Gema, keeping in touch with the warm earthen tones of the decor. 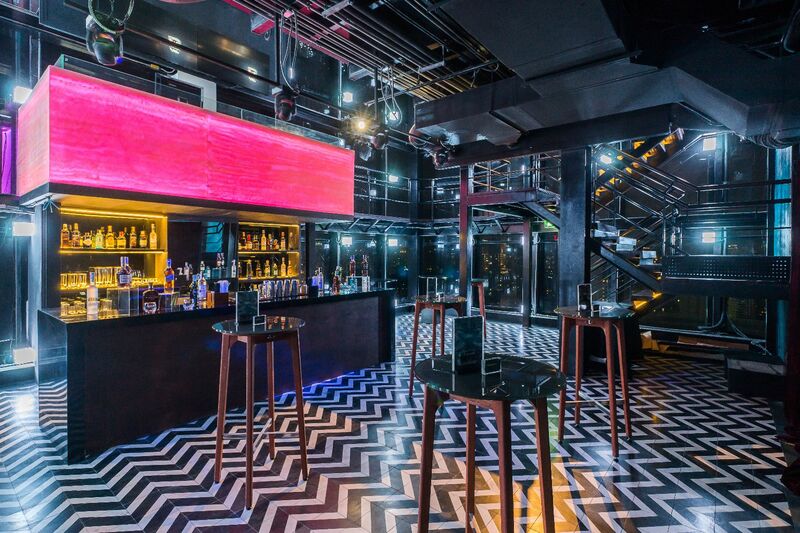 Thick carpets create a calm atmosphere, with ideal acoustics to enjoy the many live bands playing regularly. 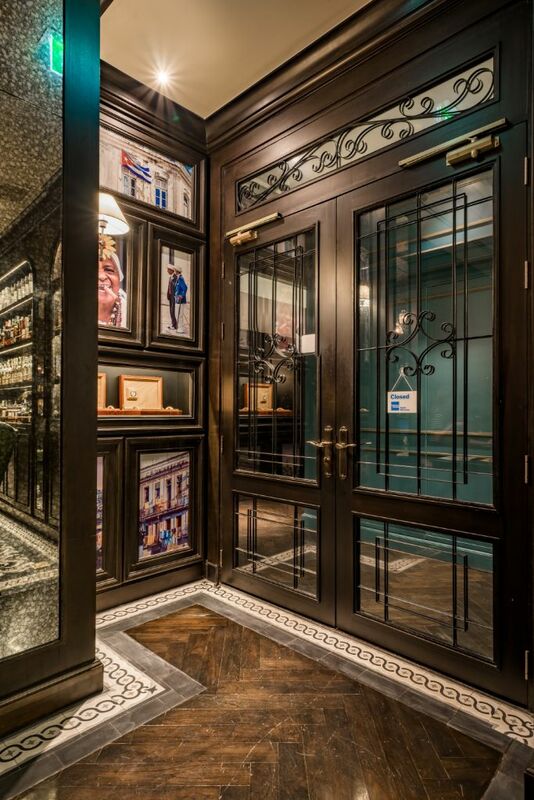 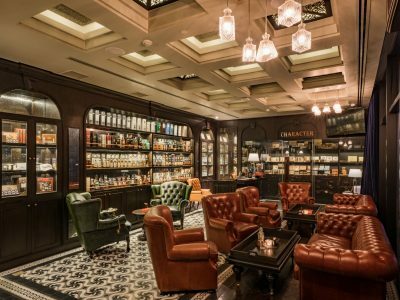 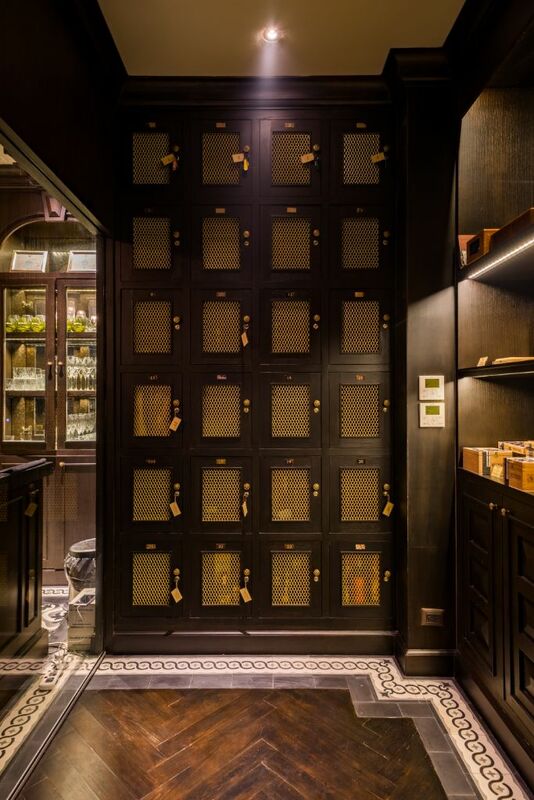 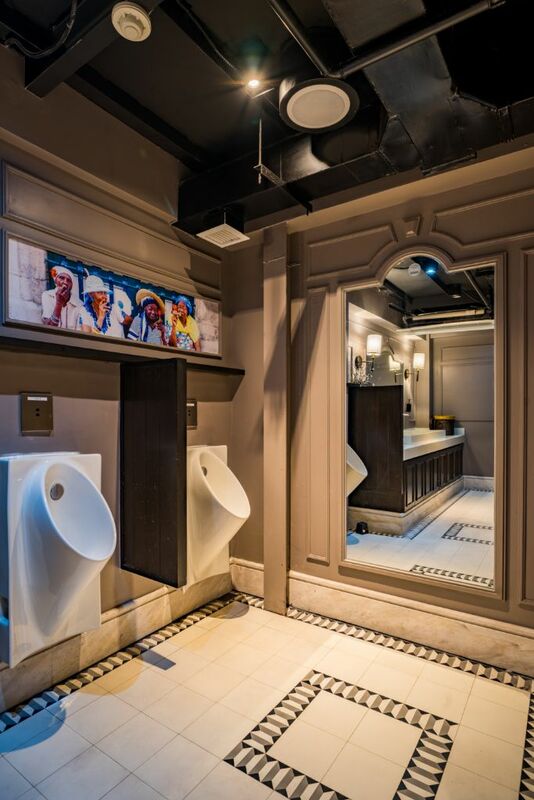 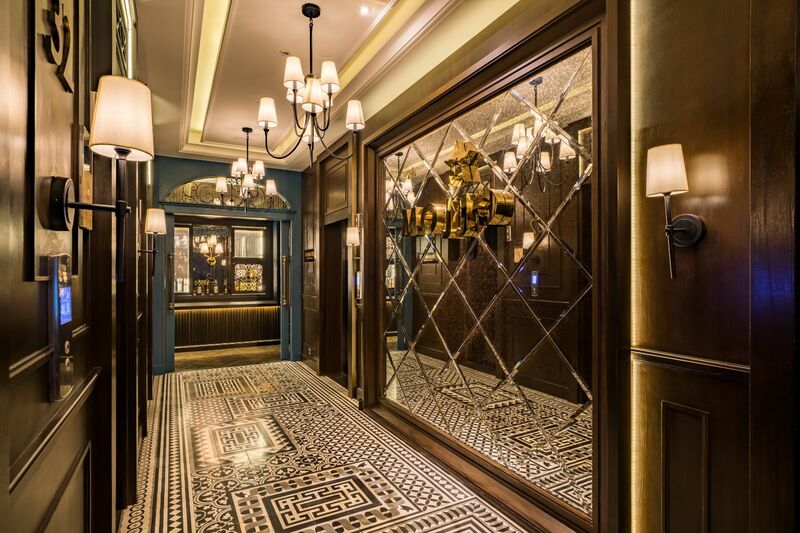 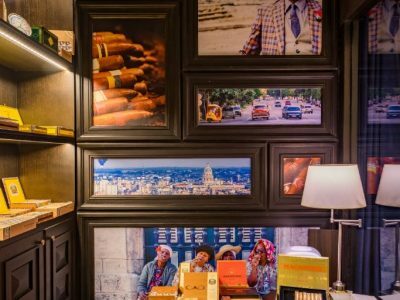 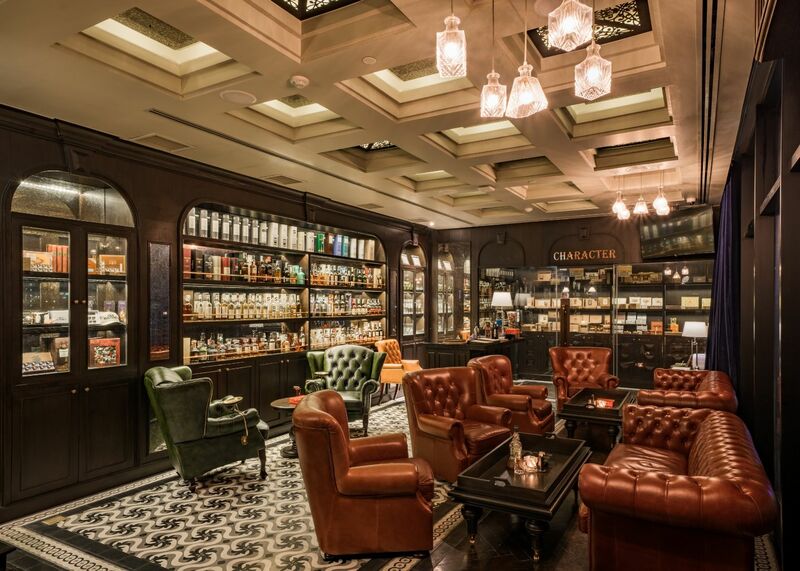 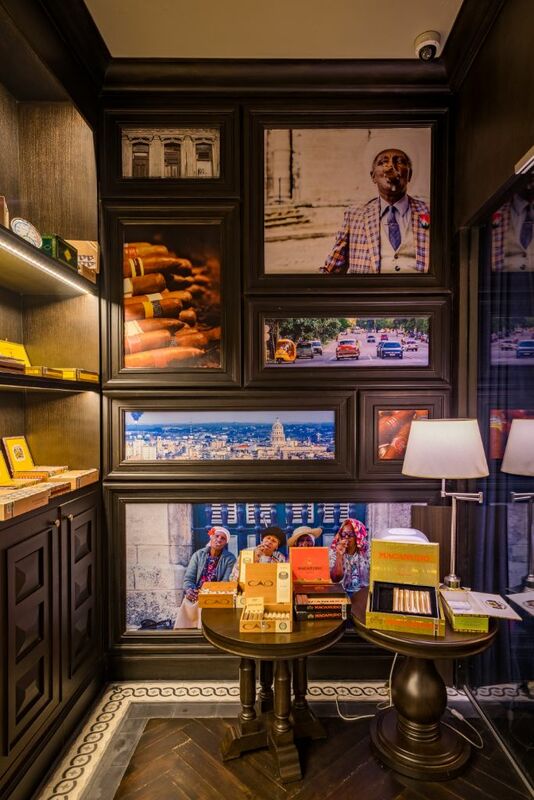 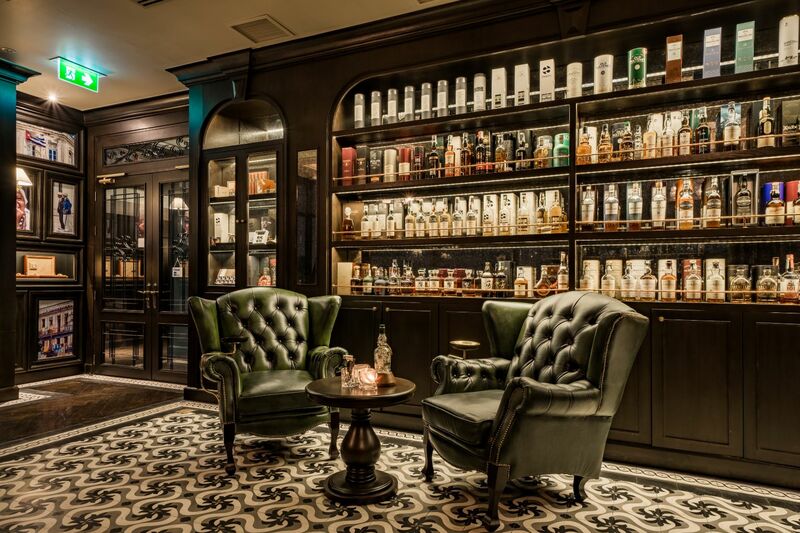 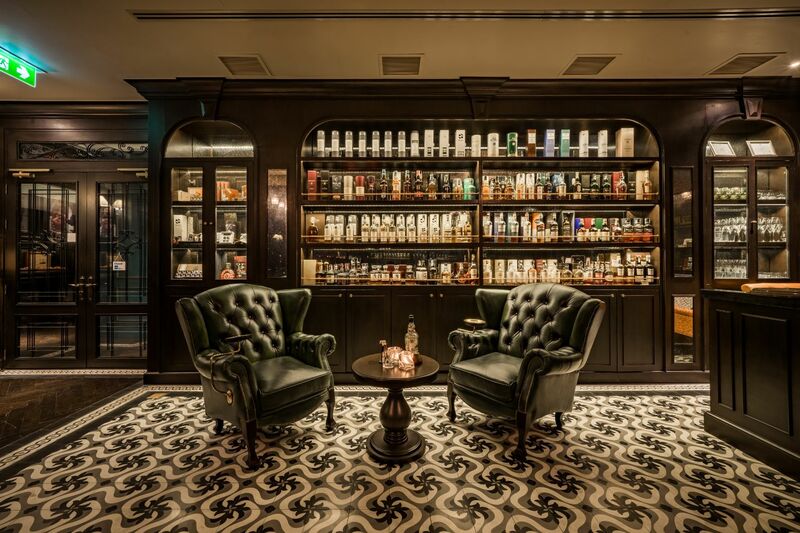 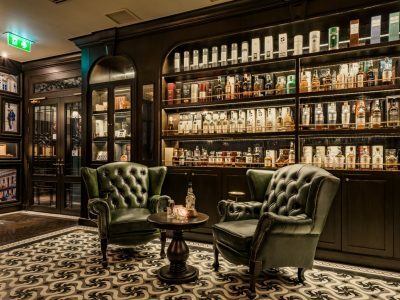 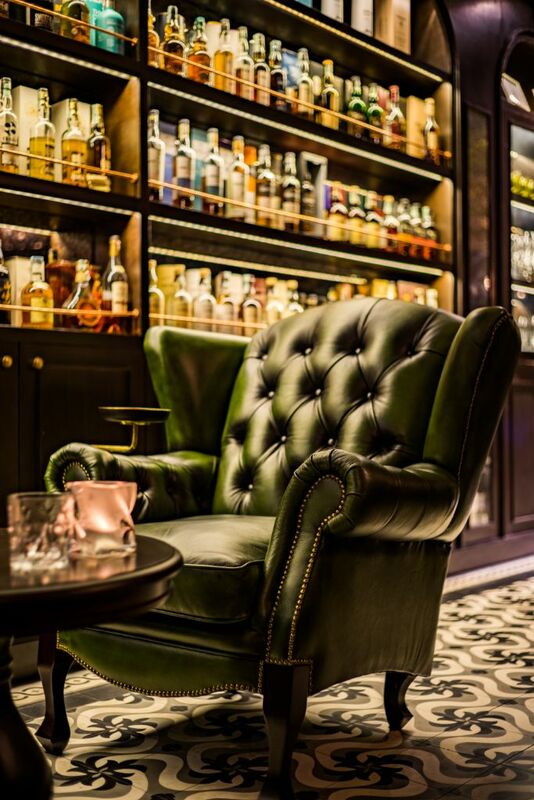 It is a safe and quiet place, perfect to enjoy an exclusive cigar in a deep leather armchair. 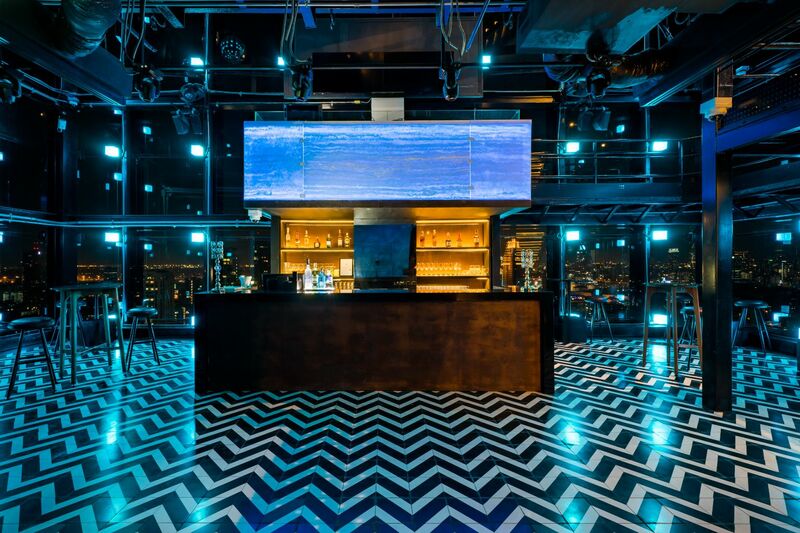 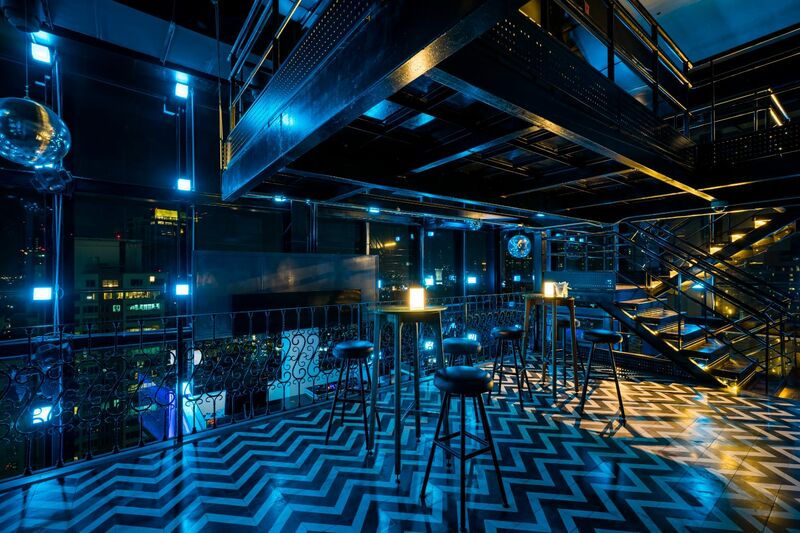 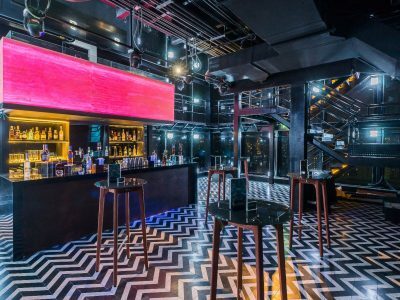 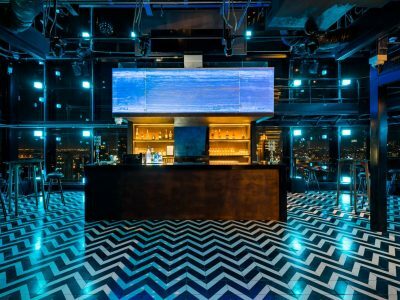 The outdoor terrace is directly visible with its classical black-and white checkered flooring, protecting the main space from the incessant and chaotic metropolis at its feet. 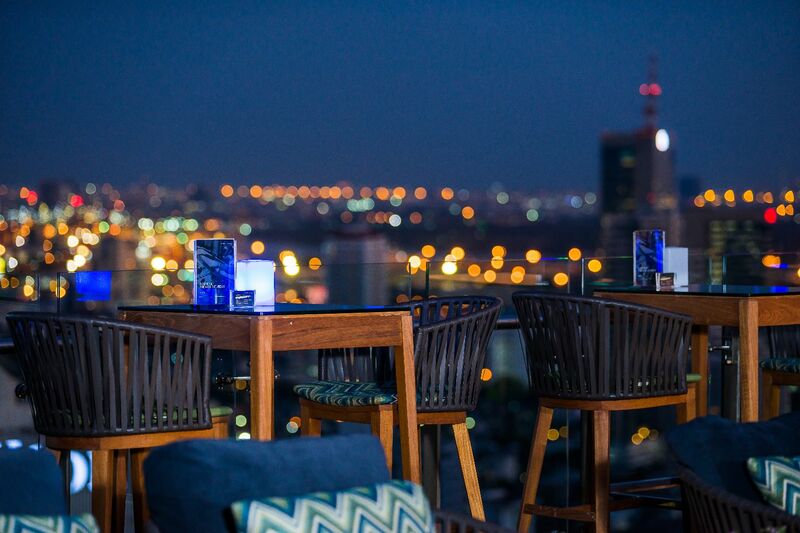 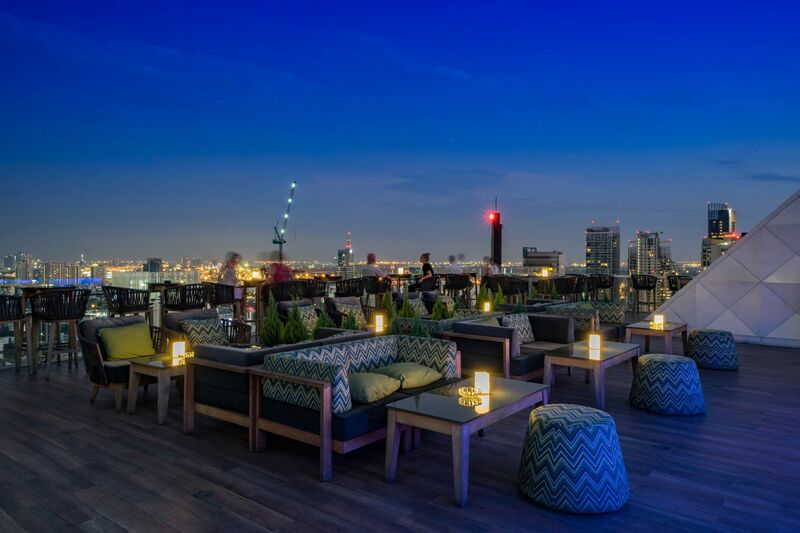 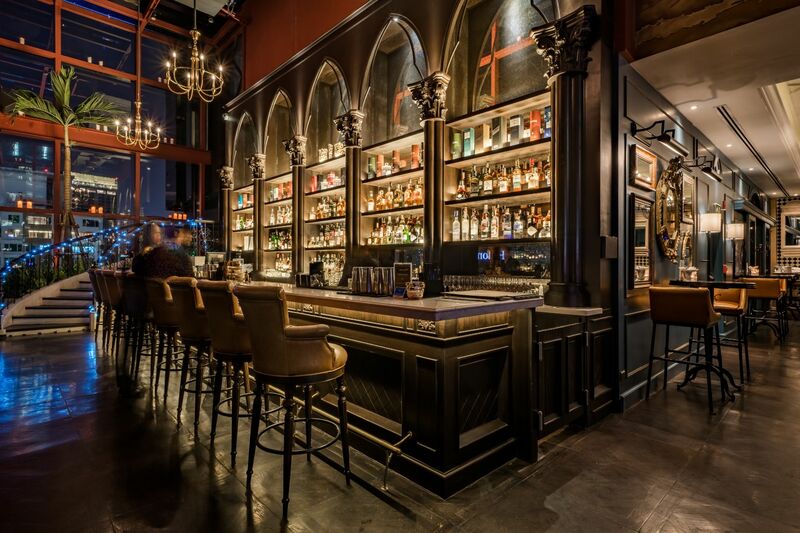 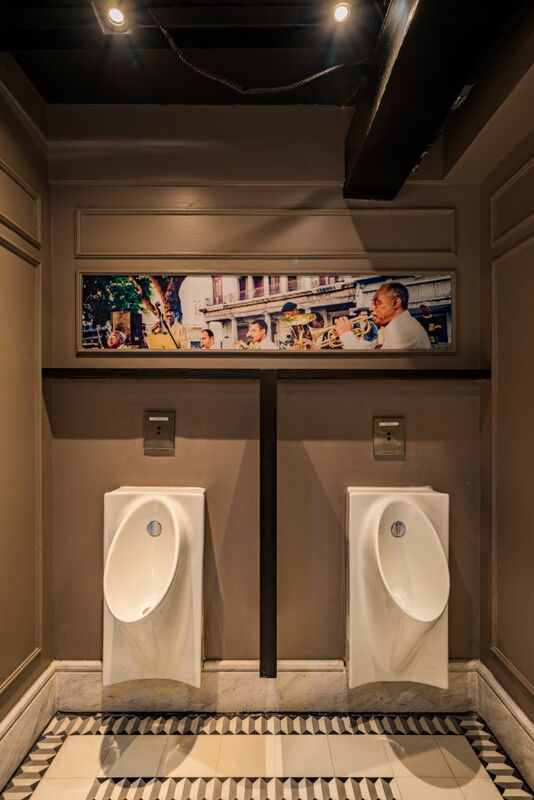 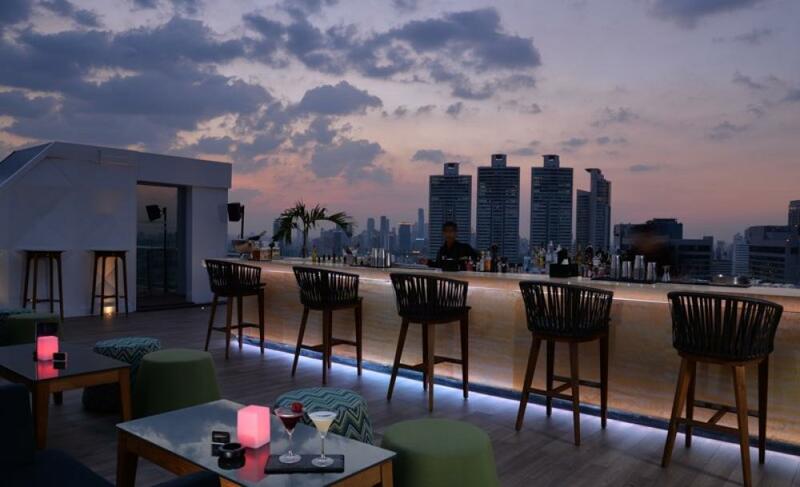 An exterior bar overlooking the city faces private alcoves under trellises where larger groups can meet and relax. 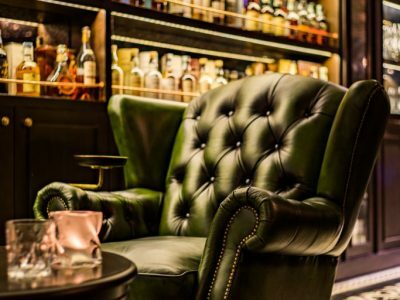 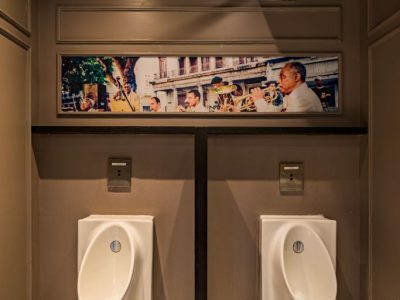 The Mojjo offers a sanctuary of peace, a friendly time capsule to unwind. 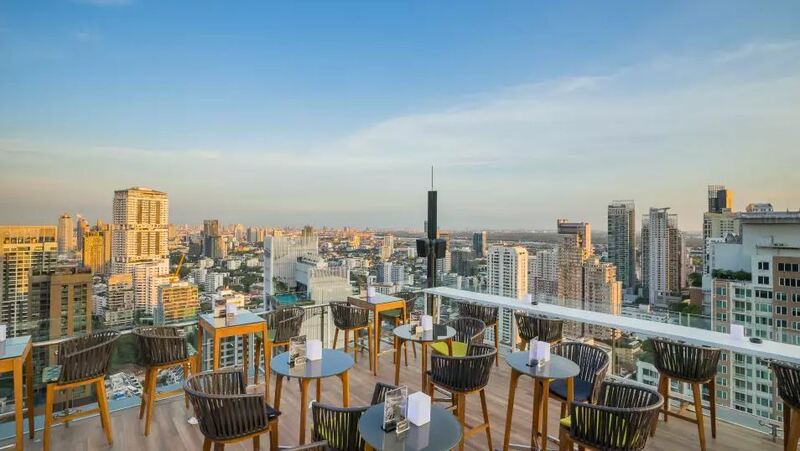 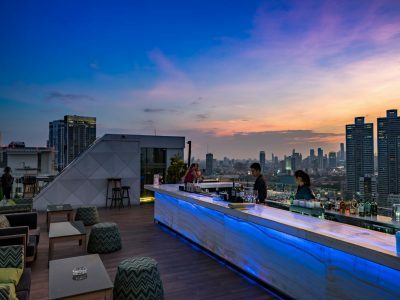 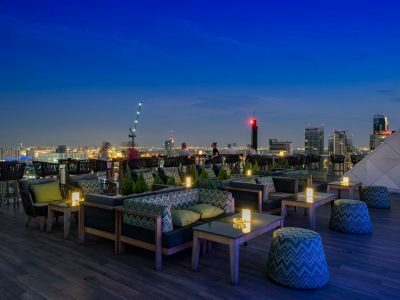 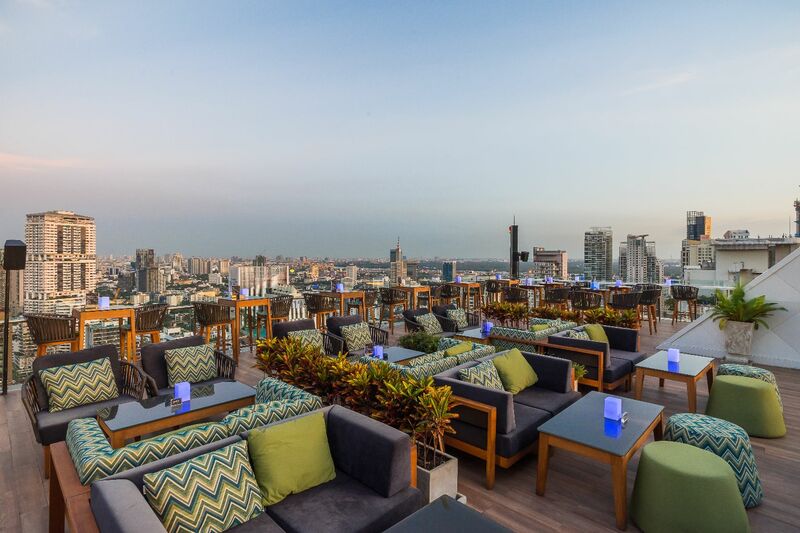 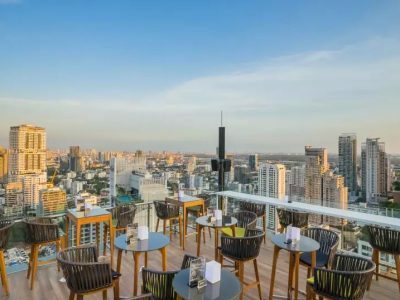 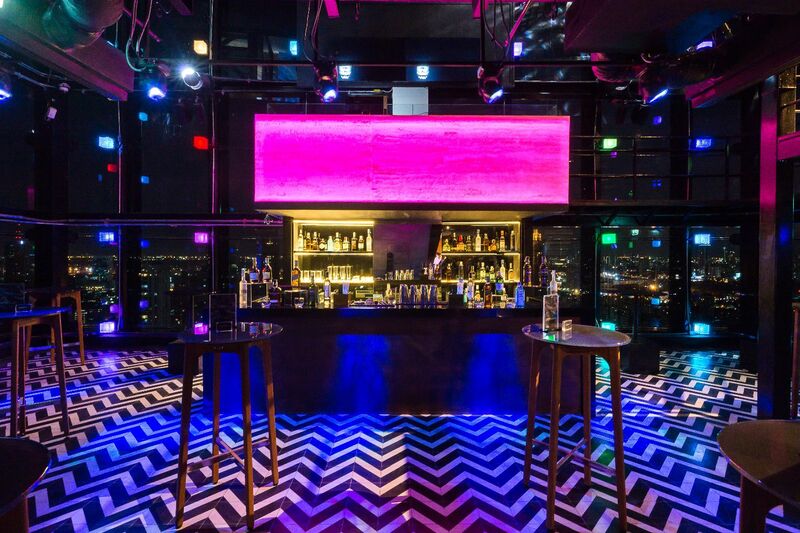 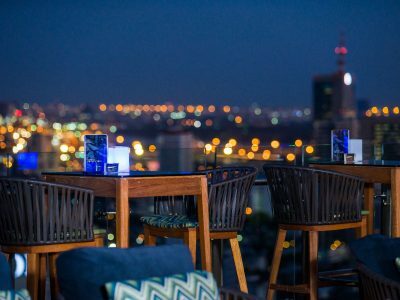 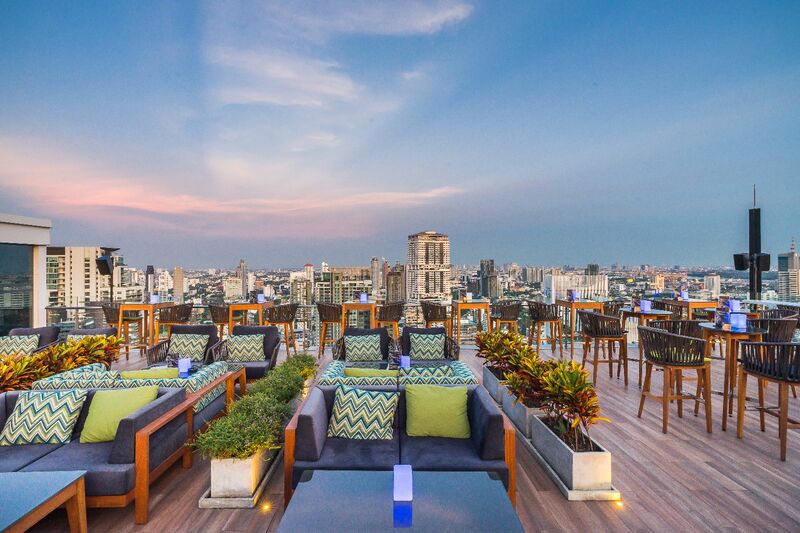 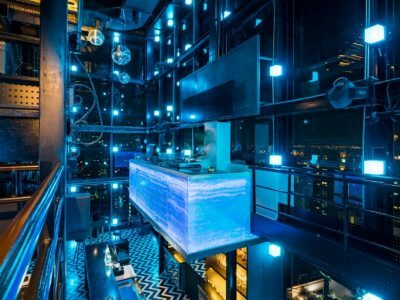 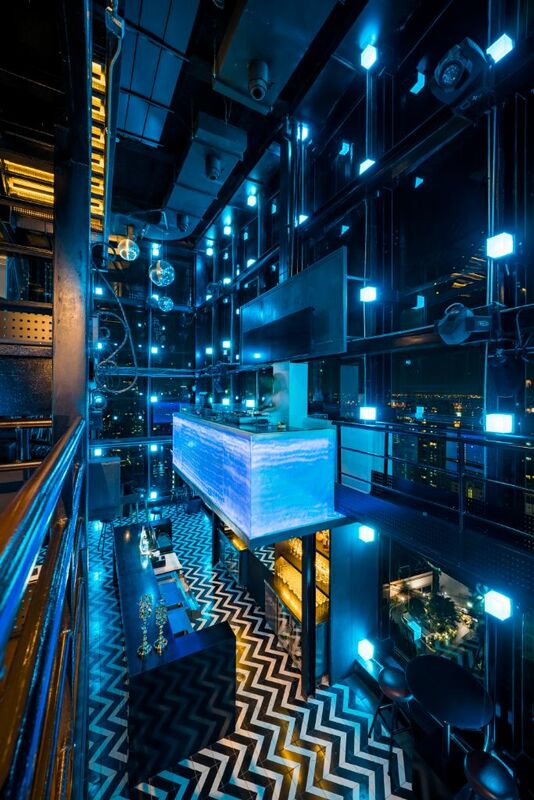 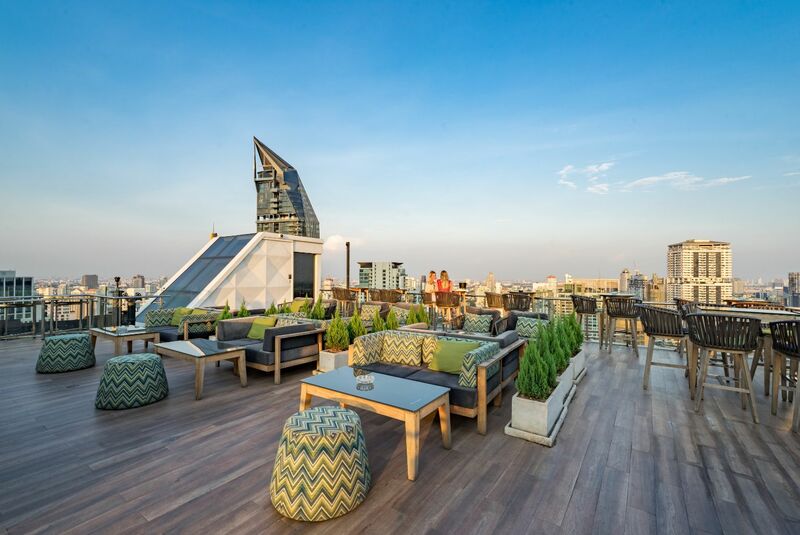 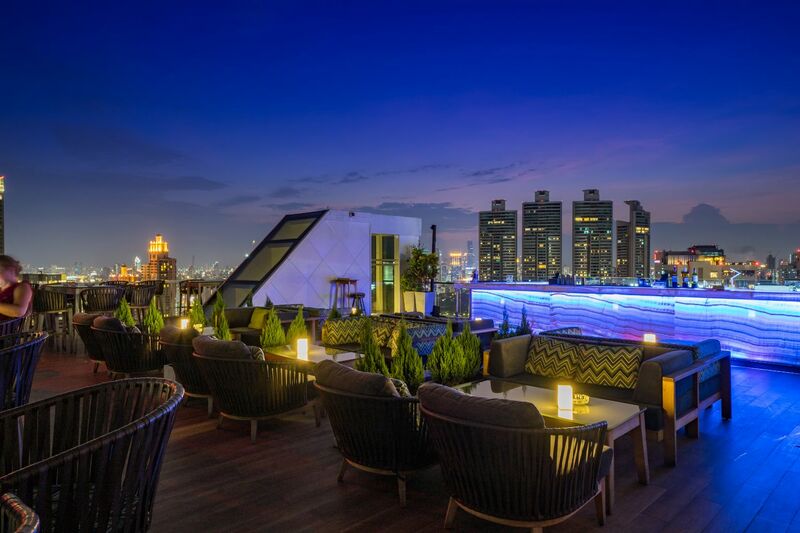 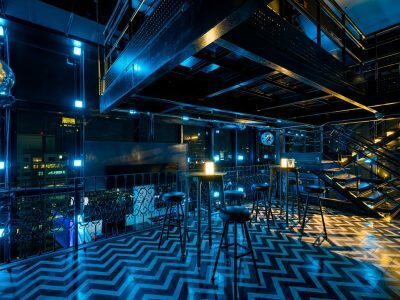 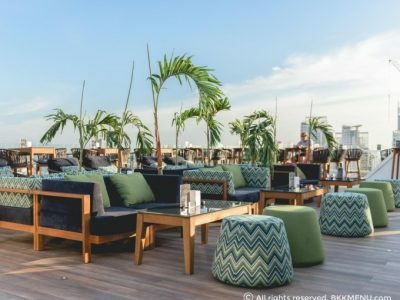 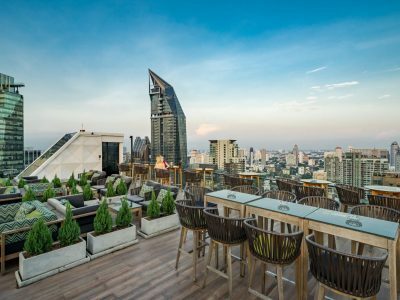 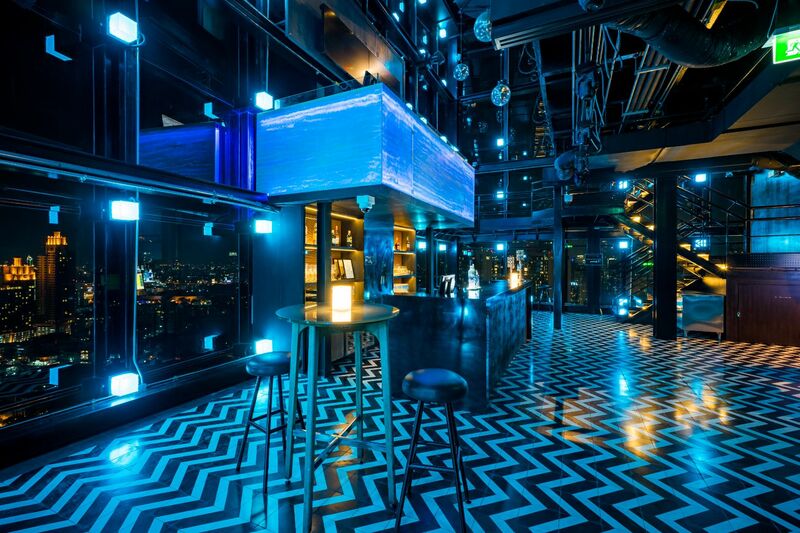 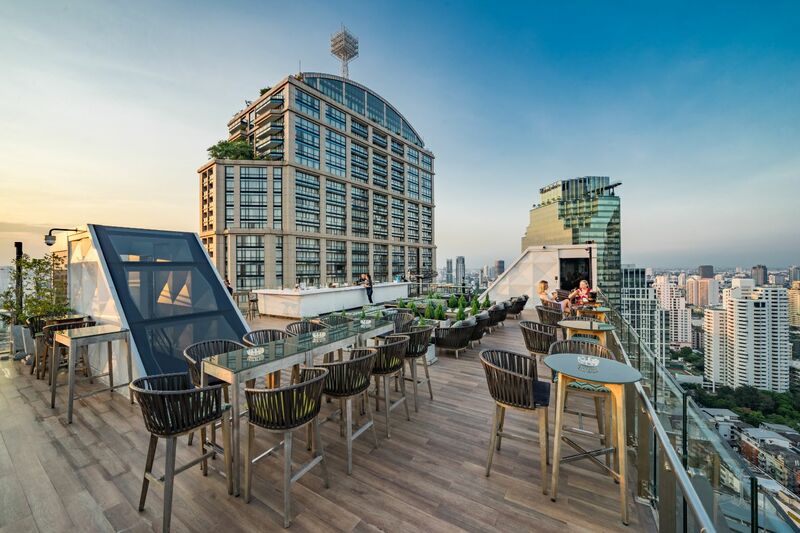 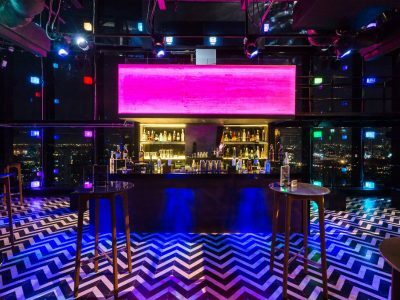 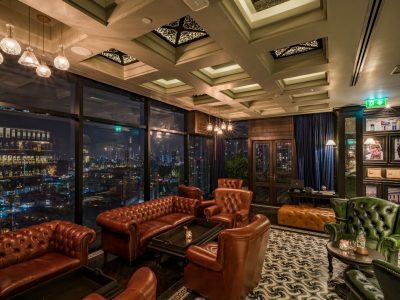 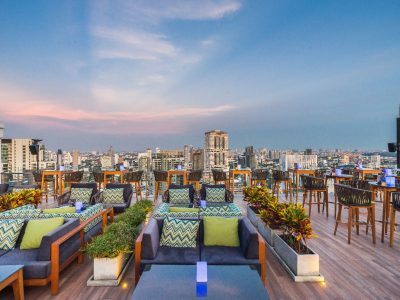 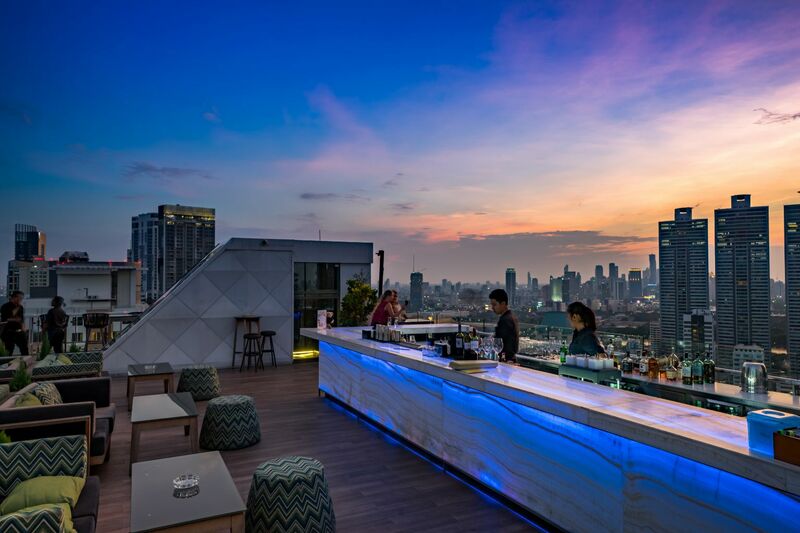 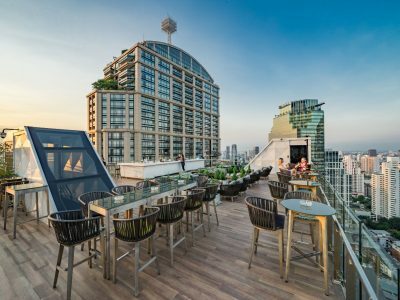 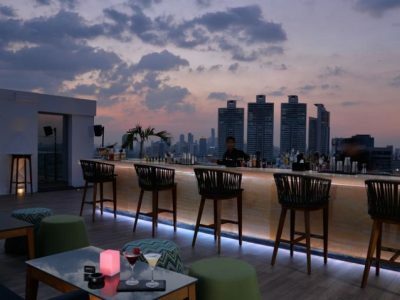 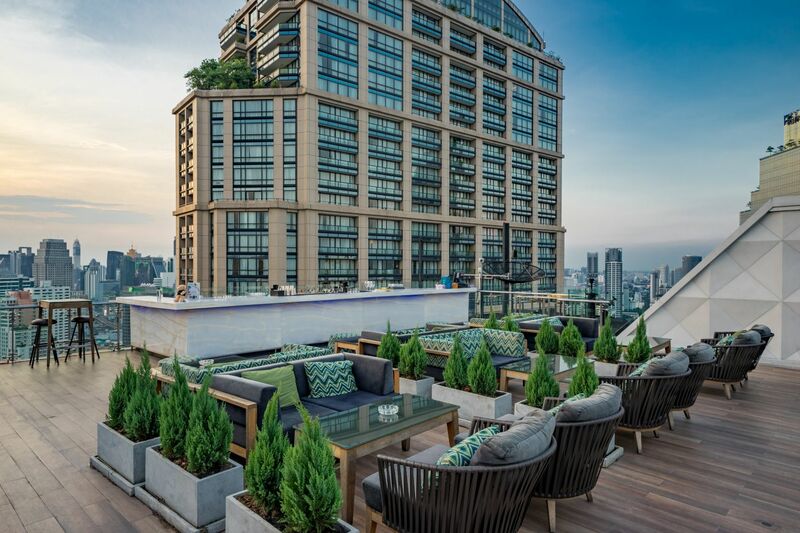 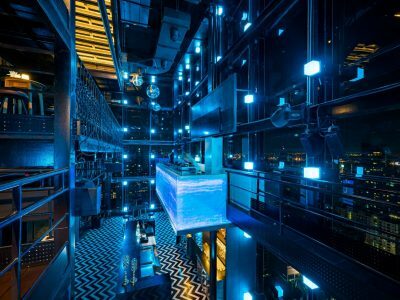 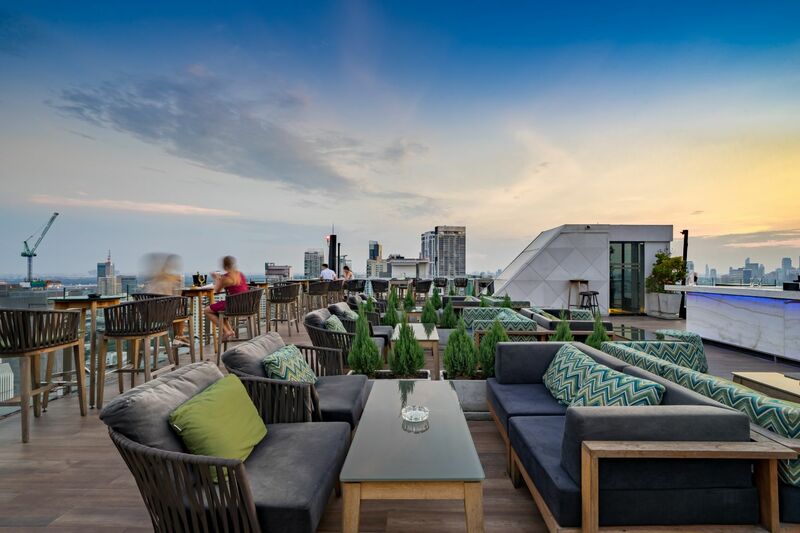 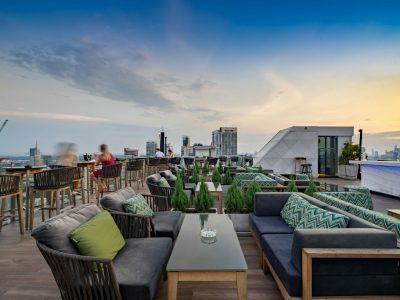 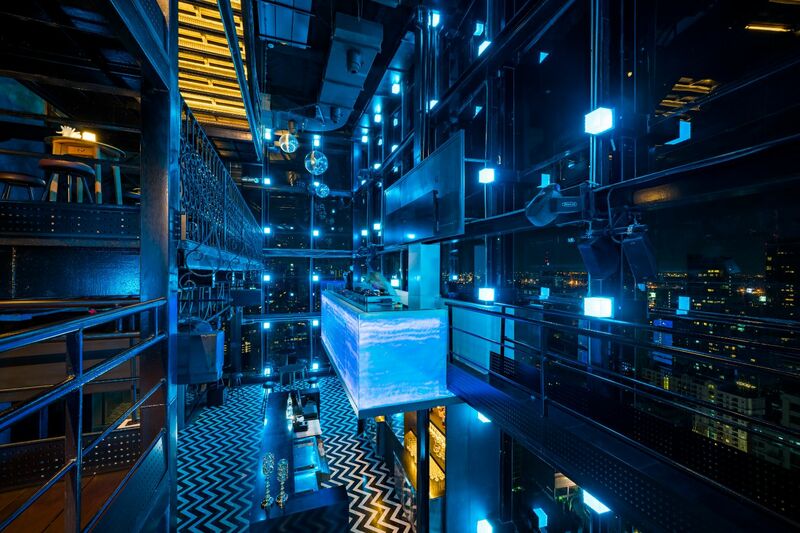 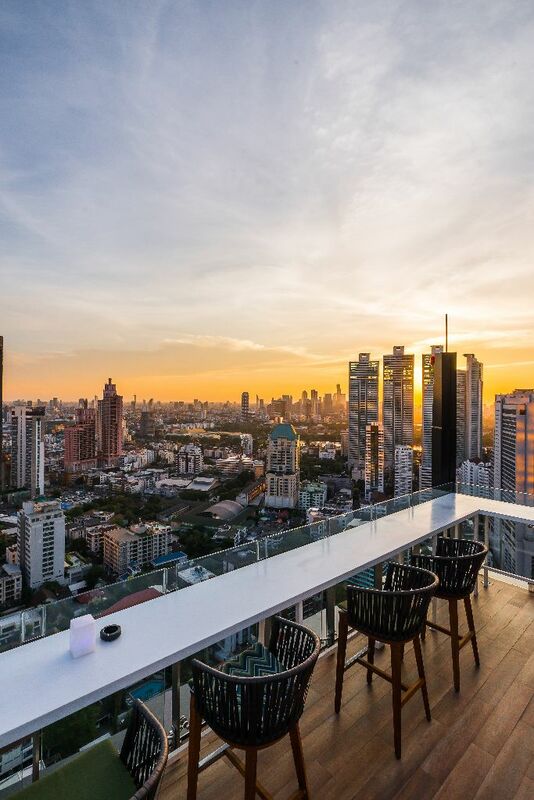 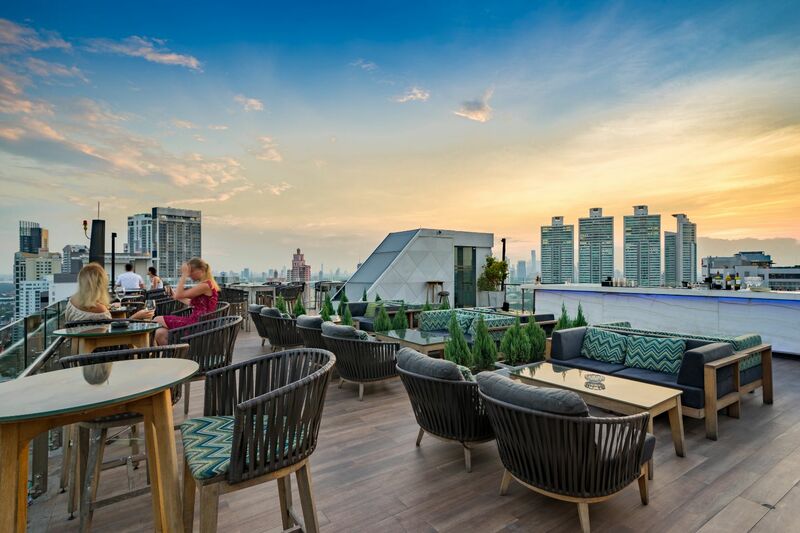 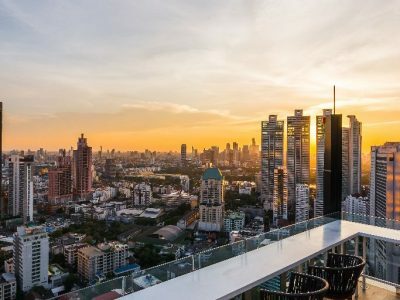 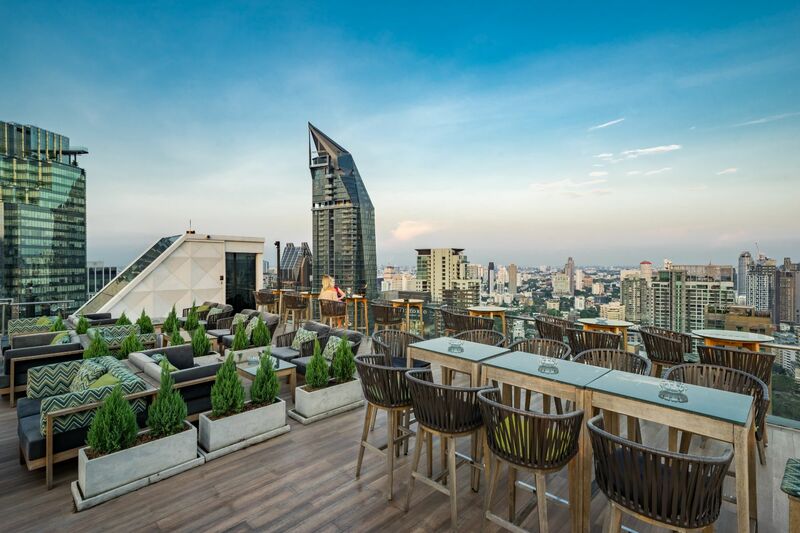 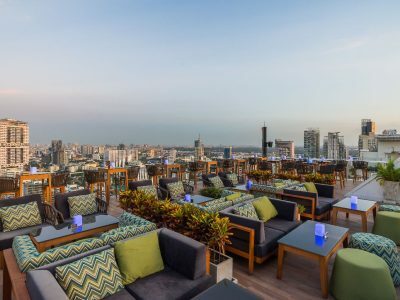 But this is only the first part of Gema’s participation with the Compass SkyView Hotel as, from the Mojjo Lounge Bar on the 32nd floor, we can now reach the rooftop on the 36th floor through a spectacular enclosed stairwell overlooking Bangkok. 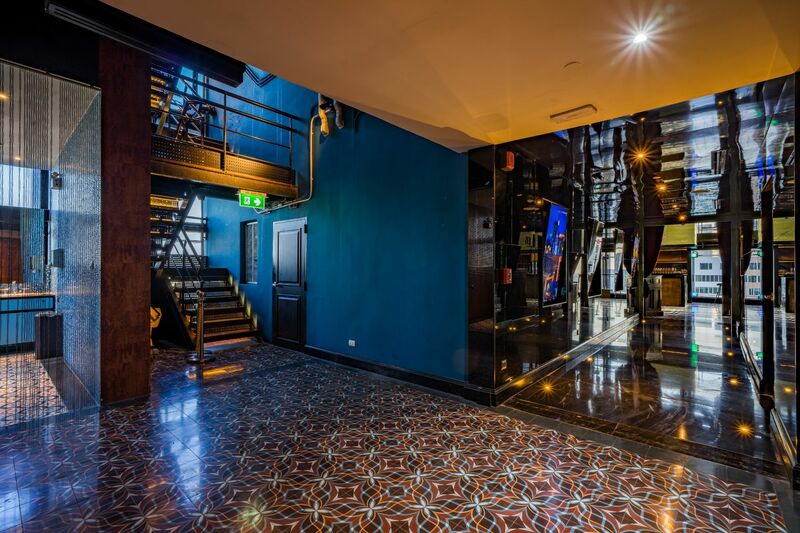 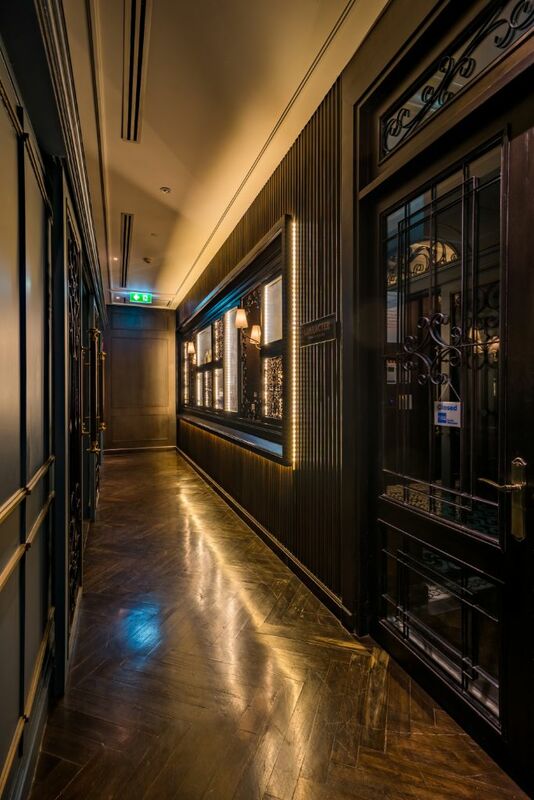 Exiting from this staircase, we discover the open air Vanilla Sky Bar with full 360 degrees views over the city. 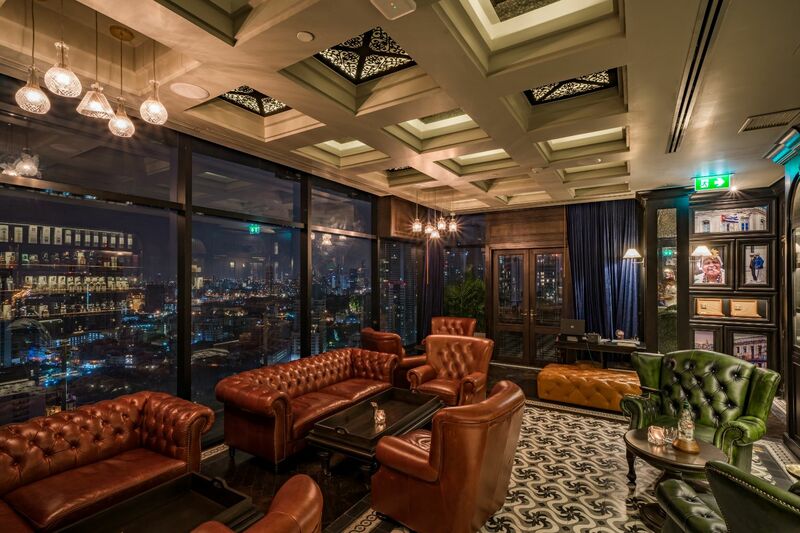 Wood floorings define this open space where nice sofas surround small palm trees. The minimalist furniture selected by Gema – Architecture and Interior Design, from its experience in outdoor and resort design, let the real star of the night shine: the clear skyline stretching in every direction beyond the glass rail where small high tables offer more romantic seating. 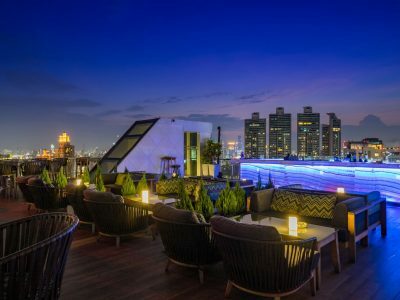 And just below, the Benjasiri Park presents a peaceful break from the incessant Bangkok nights. 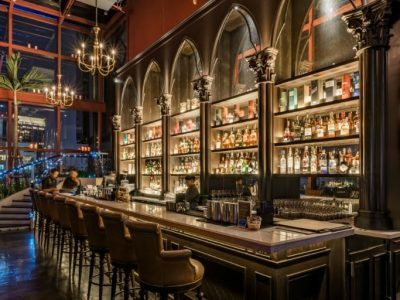 Still early: time to order a cocktail!